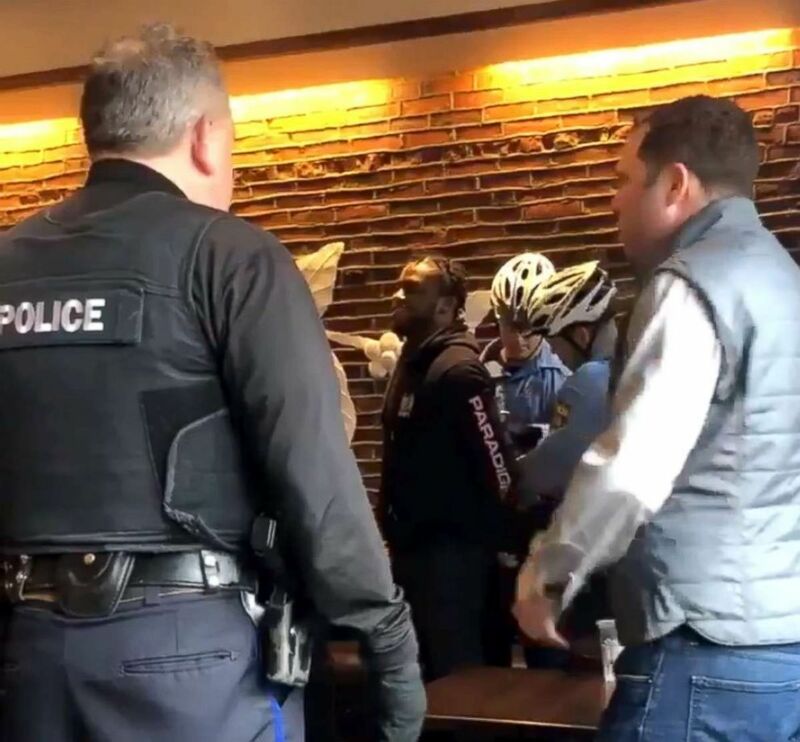 Two black men were handcuffed and paraded out the door of a downtown Philadelphia Starbucks for allegedly refusing to leave when asked by staffers and police in an incident captured in a video was posted on social media. 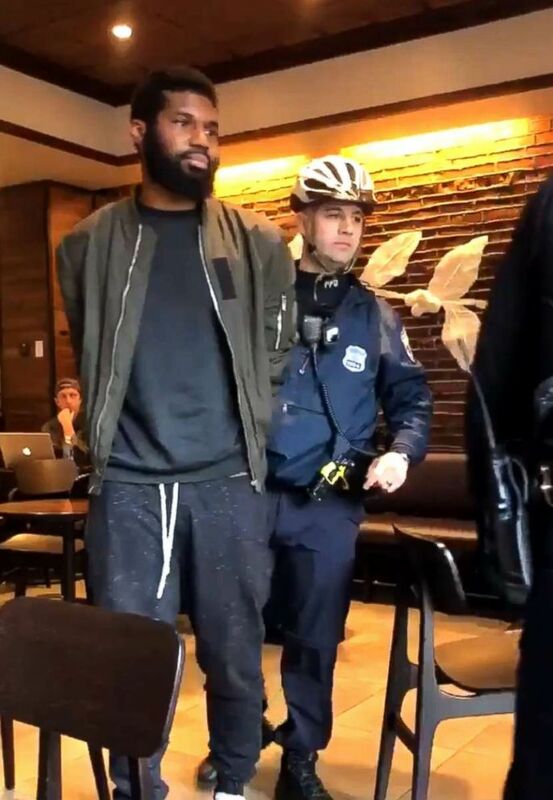 Two men were arrested at a Starbucks in Philadelphia, April 12, 2018. DePino's footage immediately went viral on Twitter, racking up more than 4 million views. In an interview with ABC News, DePino, a 50-year-old writer and mother of two, said a Starbucks barista shouted from behind the counter at the two men to make a purchase or leave. "They were sitting quietly minding their own business, and waiting for their friend to come," she said. DePino said she was so appalled by the incident, she refuses to go back to Starbucks. "Plenty of other local places to go," she said. The Starbucks arrest caught on video caused the City of Brotherly Love's mayor to come out criticizing the incident. Mayor Jim Kenney tweeted: "Iâm very concerned by the incident at Starbucks. I know Starbucks is reviewing it and we will be too. @PhillyPolice is conducting an internal investigation." On Saturday evening, the mayor put out another statement saying he was "heartbroken" to witness what "appears to exemplify what racial discrimination looks like in 2018." "For many, Starbucks is not just a place to buy a cup of coffee, but a place to meet up with friends or family me mbers, or to get some work done," he said in the statement. Kenney also said that he had asked the Philadelphia Commission on Human Relations to "examine the firmâs policies and procedures" and would be reaching out to Starbucks to "to begin a discussion about this." He went on to add there would be "a thorough review" of police policies with regard to "complaints like this." The same day Philadelphia Police Commissioner Richard Ross Jr. posted a detailed account of the incident, in which he defended his officers' actions. A general view of a Starbucks Coffee shop, Nov. 28, 2015. In an almost 7-minute clip, the commissioner said a trespassing and disturbance matter led to Starbucks employee s calling 911. He assured the public that he has reviewed the facts and defended the cops, saying they "did absolutely nothing wrong." "I can tell you candidly these officers did a service they were called to do," he said. In Delpino's tweet and attached video, she uses the Starbucks "@Starbucks" handle to put the company on notice that the two men who "hadn't ordered anything" while waiting for a friend to arrive were arrested "for doing nothing." In the video, both men a ppear calm and cooperative as they are led outside by the police officers. "They didn't do anything, I saw the entire thing," said one white man, who started to question the arresting officers. "What did they do wrong?" "All the other white ppl are wondering why itâs never happened to us when we do the same thing," she wrote in the tweet. Starbucks responded on Twitter, first saying it was reviewing the incident to see what "led to this unfortunate result" and later posted an apology. "We apologize to the two individuals and our customers for what took place at our Philadelphia store on Thursday," the tweet states. The company said it was "disappointed this led to an arrest" and that they "take these matters seriously." The coffee company also stated in the tweet that it will begin to take a look at its policies to determine whether they need to be updated. "We are reviewing our policies and will continue to engage with the community and the police department to try to ensure these types of situations never happen in any of our stores," the tweet reads. Still, in his account, the police commissioner' said the officers' actions were justified. The employees allegedly told the two men they were not permitted to use the restroom since they weren't paying customers. "And so they asked the two males to leave and they refused to leave and the police were called," Ross said in the video posted on the department's Facebook page. The two men were then allegedly told that the police would be called and allegedly responded, "Go ahead and call the police. We don't care," according to Ross's retelling of the police officers' account. Commissioner Richard Ross of the Philadelphia Police Department gives a statement on the incident that occurred at a Starbucks on April 12, 2018. 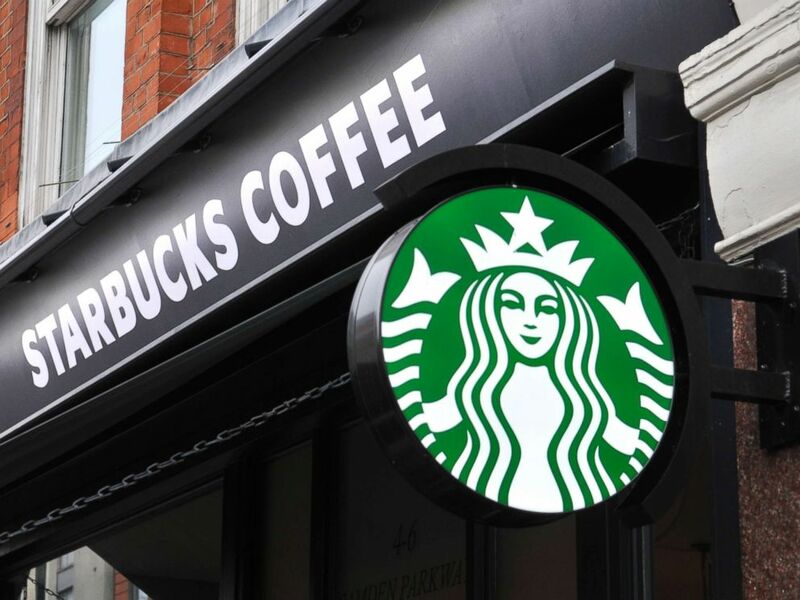 When the c ops arrived at the Starbucks, Ross said, they also asked the men to leave and they again refused and one of them allegedly took a verbal jab at the cops saying, 'You don't actually know what you're doing. You're only a $45,000 a year employee," Ross stated in the video. Ross said that the police remained professional and they "followed policy and they did what they are supposed to do." The officers "got the opposite back," the commissioner said. He also noted that it was only while the men were being processed that they were alerted that Starbucks "no longer wanted to prosecute." 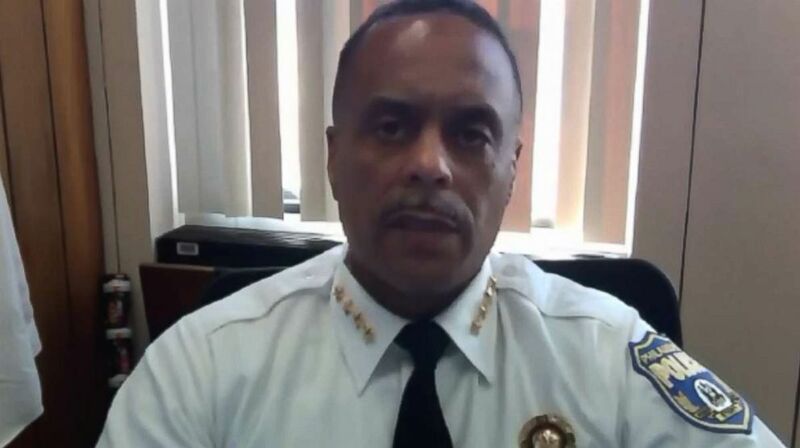 The commissioner also stated that he was speaking "as an African American" beyond being the top cop and that he was "very aware of implicit bias." He said that he has made it a priority for his department -- both rank and file as well as commanders -- to receive racially-sensitive training that includes taking field trips to the National Museum of African American History and Culture and the United States Holocaust Memorial Museum in Washington D.C.
"We do this because we want people, our officers, our recruits to understand the minute they come on board to know about the atrocities that were committed by policing around the world," Ross said.